Florida is particularly popular for the growth of palm trees. 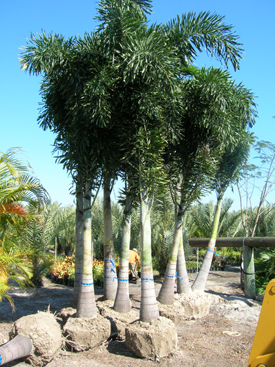 We have made available our palm tree stocks in Jacksonville for our clients to choose from the wide range of species. We have various stocks of palm tree species with different sizes and shapes for our clients to choose from. Northeast Florida and particularly Jacksonville is renowned for its variant species of palm tree for decades. Finding Jacksonville palm tree for sale is now easier in Florida than ever before due to our endless efforts to serving the whole of Florida with high quality palm trees. Most people are aware that palm trees best thrive in warm tropical climates. Is a city in northern Florida such as Jacksonville a place where Palm Trees can thrive. The answer is simply yes, despite the colder winter climate of Jacksonville for a Florida City. There is a good number of palm trees that can endure the cold tropics hence can be used for landscaping in Jacksonville as well. Some of the various palm trees that can be found or can be grown in Jacksonville include the canary date palm tree, tracing its origin from the sandy areas Northwest Africa. For this reason, they have excellent performance in sandy beaches of Jacksonville and the entire climate of the area. They can also withstand the salty nature of the soils around Jacksonville making them most famous around the area. Canary date palm have a wing span of up to 25 feet with a growth of up to 50 feet when fully mature. Their growth rate is also tolerable, at 4 inches per year. They are best used as centerpieces in landscaping and can also be substituted with another close species, the Silvester palm. Windmill palms are known to be the toughest of the palm tree species for being able to endure even the coldest temperatures of up to 00 F. they have a slower growth rate though as compared to the other species found in the warm tropics of Florida, growing at an average of 2 inches per year. Due to its endurance, one can never miss to find Jacksonville palm trees for sale in our wide range of species stock. At maturity, windmill palms can attain a height of between 8 to feet. They often give a good landscaping appeal when used in groups of three. Palmetto, a native species to the Southeast of United States is another cold and hardy palm tree suitable for landscaping in Jacksonville. This specie is tolerant to salty soils and can also withstand drought to a great deal. For this reason, one does not have much maintenance to be done, but rather to watch them grow at a rate of 2 to 3 inches in a year. A typical specie can grow up to heights of 5 to 6 feet upon reaching maturity. The dwarf sugar palms are very famous for use around pools due to their little maintenance requirements plus their less messy nature. Dwarf sugar palms can withstand the colder conditions of Jacksonville and other northeast parts of Florida. Their growth rate is equally slow due to the cold surroundings, attaining maturity at a height of 12 to 14 feet.